That’s why the Apps Script team — and many other developer-focused teams at Google — record Google Developers Live episodes in which we highlight a specific topic and drill down to discuss it in detail. We also hold regular livestreamed office hours via Google+ Hangouts, which we post on YouTube afterwards. In these office hours, we discuss recent releases and give in-depth tutorials on topics interesting to Apps Script users. Now that the 2013’s GDLs and office hours are underway, let’s recap six topics we discussed in GDL segments over the last few months. Triggers are an incredibly powerful part of Apps Script that allow developers to run code non-interactively. In this video, I talk about ways to schedule code via the GUI as well as programmatically, and briefly touch on intermediate topics such as common patterns and pitfalls when working with triggers. Charts are a great way to visualize data. In this next video, Kalyan Reddy starts with a few slides about Apps Script’s Charts Service, then works his way into code samples for an application that pulls data from the StackOverflow API in order to create an online dashboard that displays contributions from top developers. If you want to follow along, Kalyan’s code samples are available on Github. BigQuery is a Google service that allows developers to analyze massive datasets very quickly in the cloud. In this video, Michael Manoochehri from the BigQuery team joins us to talk about how to use Apps Script to automatically export aggregate BigQuery data into Google Sheets to make it easier to share. This show dovetails nicely with Kalyan’s video about charts (above), in which you’ll learn how to quickly wire up visualizations for the exported data. And what developer doesn’t love Google Analytics? Although Analytics has built-in mechanisms to export data from the UI, it also provides an API for automated data retrieval. Nick Mihailovski from the Google Analytics team joins us to talk about the reasons why people might want to do this, and to demonstrate a toolkit that makes it easy to work with Google Analytics data within Google Sheets. Many Google Apps users are also Salesforce users. In this show, Arun Nagarajan explains how to integrate Google Apps with Salesforce via Apps Script, and shows off a few code samples that demonstrate moving data between Salesforce and Google Apps in either direction. Make sure to grab a copy of Arun’s code samples on Github. Need to build a robodialer or otherwise automate voice calls? Twilio provides an API for doing just that. Arun and Eric Koleda take us through some of the cool possibilities for integrating Twilio’s API with Google Apps. We had a lot of fun setting up the studio for this one, and it’s one of the most fun to watch. Here’s the code on Github. Of course, if you want to hear our tricks and tips as soon as possible, you’ll should watch Google Developers Live, well, live — so check out the calendar of upcoming episodes for Apps Script and Drive. If you have any ideas for further segments you’d like to see, leave a suggestion in the comments below! We’d love to hear your feedback. Ikai is a Developer Programs Engineer working on Google Apps Script but transitioning to the YouTube team. Ikai is an avid technologist, consuming volumes of material about new programming languages, frameworks or services, though more often than not you'll find him advocating pragmatism over dogma in the solutions he proposes. In his free time, he enjoys the great outdoors, winning Chinese language karaoke contests and playing flag football. He resides in New York City, where he watches in anguish as his favorite sports teams from the San Francisco Bay Area implode season after season. Sometimes you just want to sit uninterrupted at your keyboard, bashing out a clever Apps Script to automate your life and your work … but sometimes you want to see how Google experts approach the tough problems. Sometimes you want to draw on other Apps Scripters for inspiration or help. Some of you might have already heard of the upcoming Google Drive Realtime API at Google IO 2012. The Google Drive Realtime API will allow you to use the technology that powers the realtime collaboration features of Google products such as Google Docs and Google Sheets in your own application. It will handle all aspects of data transmission, storage, and conflict resolution when multiple users are editing. We also told developers about an upcoming Push Notifications system at Google IO 2012. Push Notifications will allow you to get near-instant notifications when files are modified in Google Drive. In the past you would typically have had to frequently poll the Drive API to check if files have been modified to obtain similar results, Push notifications makes this super efficient. Please fill out our signup form to tell us more about your use case and we’ll contact you shortly. We're looking for a small set of developers that are committed to building apps for Google Drive to join our Google Drive SDK early access program. Participants will get early access to upcoming features and the opportunity to shape the direction of the SDK. This is an ongoing program covering multiple aspects of the API, and there are two new features that we're ready to share with developers. I haven’t explained the randomSegment() function, but you can probably guess at how it works based on the description above. Still, if you want to dig in further, you can view the full source code here. And presto chango, you have a web app that harnesses the tremendous power of Google’s infrastructure … to produce names that could only ever exist in a parallel universe. It’s like Adriano Celentano’s "Prisencolinensinainciusol" — a convincing rendition of an American pop song, unless you actually speak English, in which case it’s total gibberish. Way back in the dawn of time, before I joined Google — OK, fine, two months ago — I was a video-game designer. Occasionally, I had to come up with names for people or places. And I'm no good at naming things. So once, instead of manually naming hundreds of towns in a (fictitious) foreign country, I weaseled my way out of creativity by writing a ridiculous set of custom spreadsheet functions. My spreadsheet analyzed a list of real placenames from a similar country, then spit out plausible fake names with the same lexical structure. It worked — but I was pushing spreadsheet functions so far that the “code” (if you can call it that) became difficult to maintain. At the same time, the reason I used a spreadsheet in the first place was so I could lean on the analytical power of pivot tables. Now, before you say, “There’s no way I’d call my daughter Harliance,” remember that the goal wasn’t to produce real names. The goal was to produce names that were good enough for a video game. Perhaps Harliance is a cyborg woman of negotiable virtue in dystopian future-America? 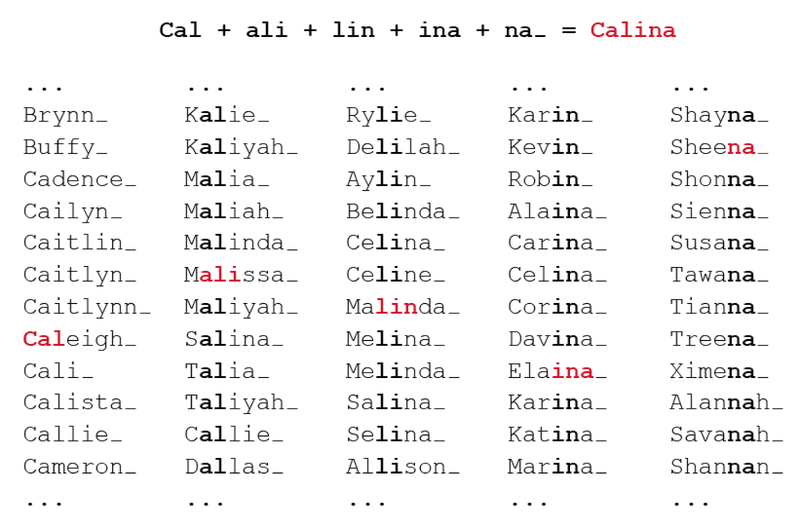 You should probably pick your daughter’s name the old-fashioned way. So let’s look at a few of the techniques that NameGen uses. 1. 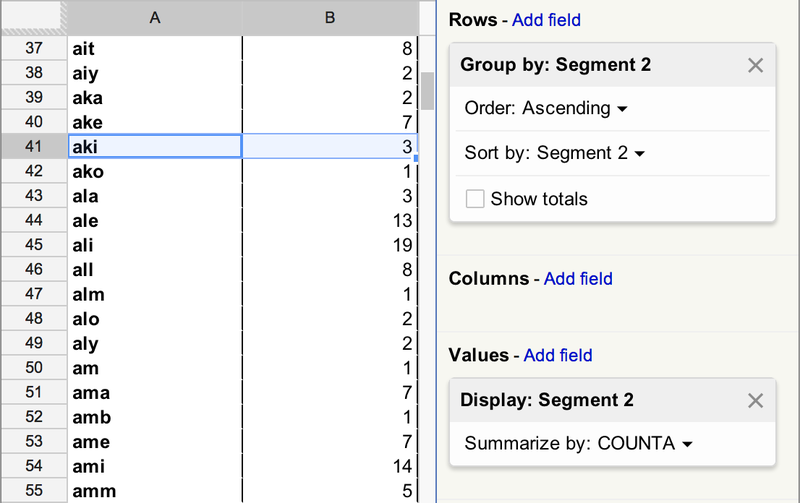 We start out in Google Sheets, first dropping a list of real names into column A, then slicing it into overlapping three-letter segments using the formula =MID($A2,COLUMN(B2)-1,3) (that’s the version of the formula you’d use in cell B2; from there, just copy and paste the formula across the rest of the sheet and the cell references will update accordingly). Here’s a sample of one of the spreadsheets so you can see how the data is set up. 3. This is where Apps Script takes over. 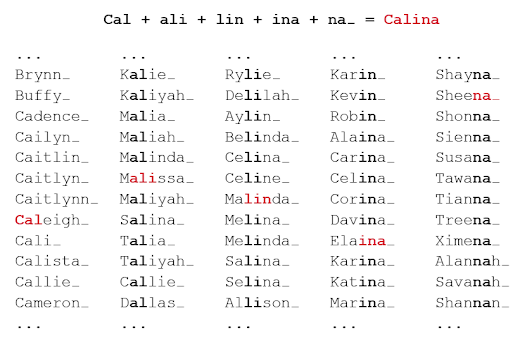 Just once per source list of names, we run the utility function below (shown slightly simplified) to convert the spreadsheet data to a more useful format and store it in ScriptDb. The script can then pull the data from ScriptDb in about 0.5s, versus about 5s to read directly from the spreadsheet. Note that we’re using Script Properties to store the spreadsheet ID rather than cluttering up the code with extra variables. // Look up the spreadsheet ID in Script Properties, then grab its sheets. // Transform each sheet into the segment object we want later. 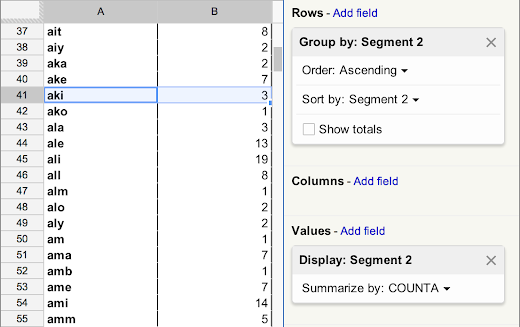 // Retrieve the list of real names (first loop) or a pivot table. // Store other properties so we can retrieve the right record later. // Save the object as a ScriptDb record, then start the loop again. // Query the database to find all results for this language. // Assemble the DB records into an array so we can pass it around. // sure it overlaps with the previous two letters. // If the segment wasn't full length (end of a name), done!